When I graduated from the College of Charleston last May, I never thought I would spend a significant part of my year off working in Antarctica. However, that’s where I ended up thanks to an amazing opportunity offered to me by Dr. Jack DiTullio. The trip down south was a chance for me to broaden the scope of my research experience, as well as a personal adventure, to say the least. Dr. DiTullio was the Chief Scientist aboard the RVIB Nathaniel B. Palmer. The Palmer set sail from Punta Arenas, Chile on December 19, 2017 to the Amundsen Sea. 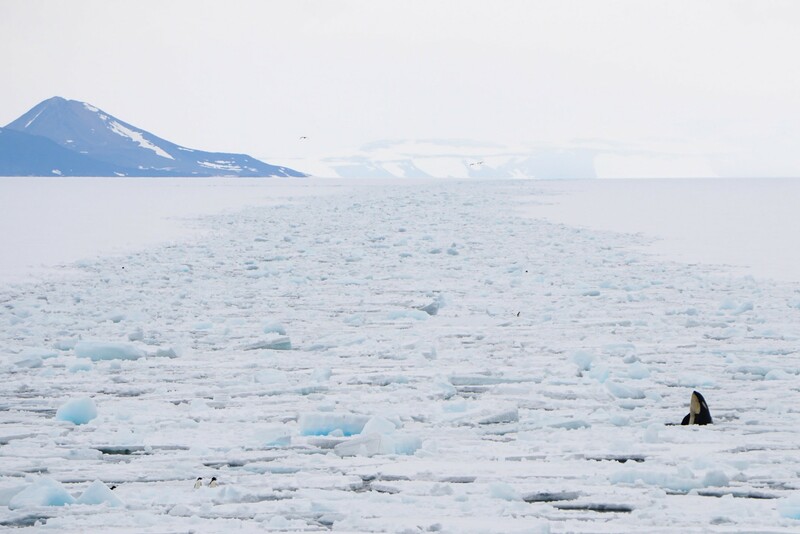 From the Amundsen we performed a transect along the Antarctic continent into Terra Nova Bay. 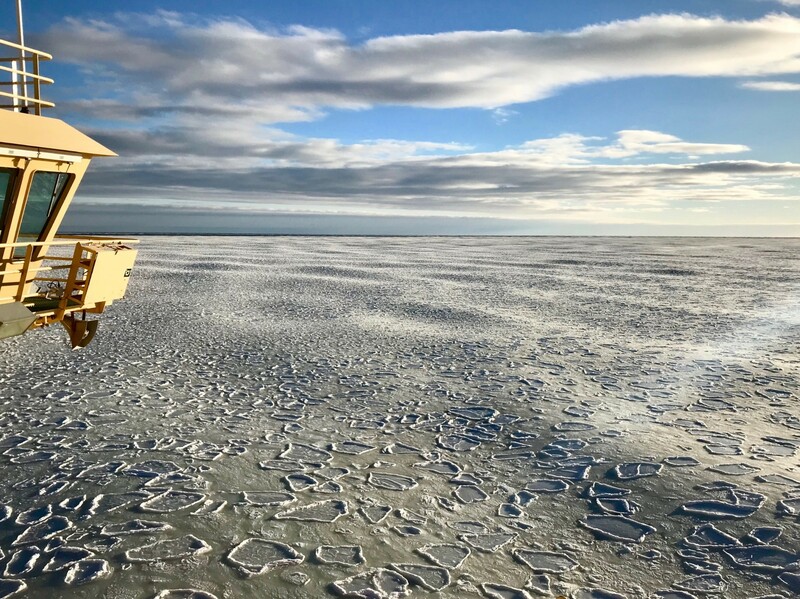 After a brief stop in McMurdo Station roughly halfway through the trip, we continued to collect data in Terra Nova Bay until we began our transit to Hobart, Tasmania where we disembarked on March 4, 2018. On board, the DiTullio group was one of four academic research groups gathering massive amounts of data over our 77 day research cruise. 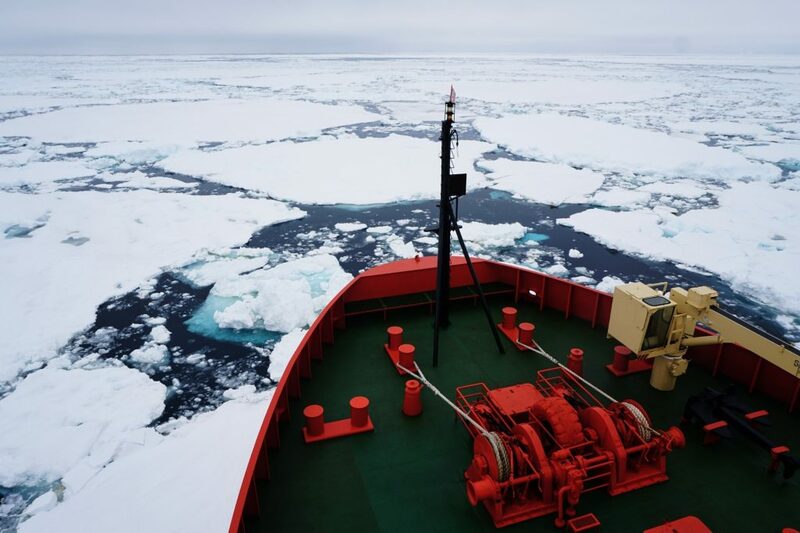 We were funded by National Science Foundation to investigate the factors that limit phytoplankton growth in the Southern Ocean. This is one of the most productive phytoplankton communities in the ocean, and it plays an important role is sequestering carbon dioxide from the atmosphere. By understanding what factors limit phytoplankton growth, we can begin to predict how this community might affect, as well as be impacted by, climate change in the future. 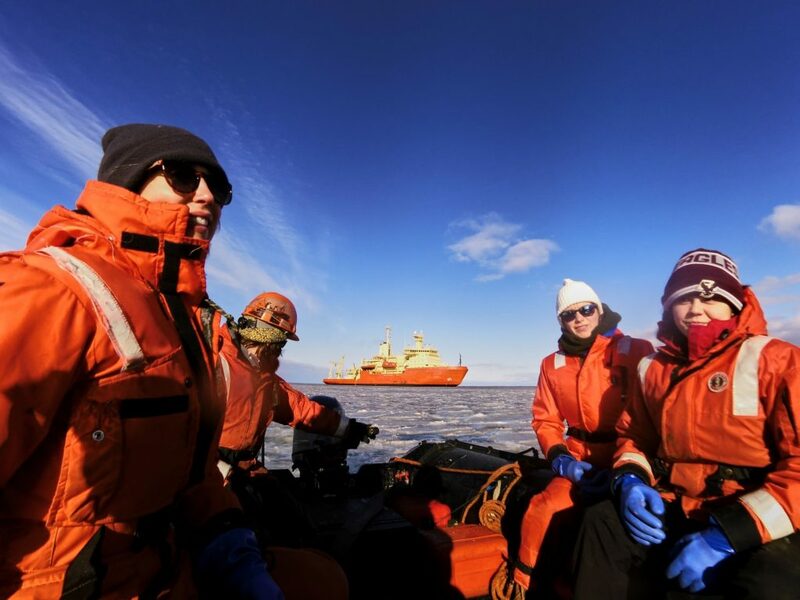 In our experiments, we explored how the limitation of iron, B12, zinc, manganese and other trace elements affected the growth, productivity, and species composition of phytoplankton in the Ross Sea. Additionally, we conducted a series of hydrocasts as we travelled from the Amundsen Sea into Terra Nova Bay. From these samples, we measured numerous variables such as chlorophyll, accessory pigment and Vitamin B12 concentrations. The data collected from the hydrocasts allow us to develop spatial and depth profiles of several biogeochemical parameters that influence the phytoplankton community. The DiTullio group also consisted of two collaborators from Italy—Francesco Bolinesi, a PhD student from the University of Naples Federico II who investigated the photosynthetic efficiency of phytoplankton, and Pasquale Castango, a physical oceanography post-doctoral researcher from the Parthenope University of Naples. We worked closely with Dr. Mak Saito’s group from the Wood’s Hole Oceanographic Institute (WHOI). The Saito group focuses on trace metal chemical oceanography and worked with us to set up experiments investigating the effects of various trace metals on phytoplankton growth and productivity. Their sampling involved the use of a separate trace metal clean rosette which allowed them to measure concentrations of various trace metals (e.g. iron, cobalt, zinc, etc.) 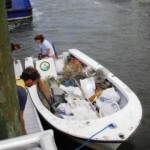 that may greatly affect phytoplankton growth and productivity throughout the cruise. The WHOI group also collected large volume in-situ filtered water samples for measuring protein concentrations. Dr. Rob Dunbar’s group from Stanford investigated dissolved oxygen isotopes and salinity changes in seawater to determine how much water at a given location and depth came from basal ice melt, which can be used as evidence for rates of glacial melt in Antarctica. Additionally, throughout the cruise they collected data to investigate carbon cycling, and one graduate student, Michael Bollen from the University of Otago, New Zealand also collected samples for diatom identification and abundance. 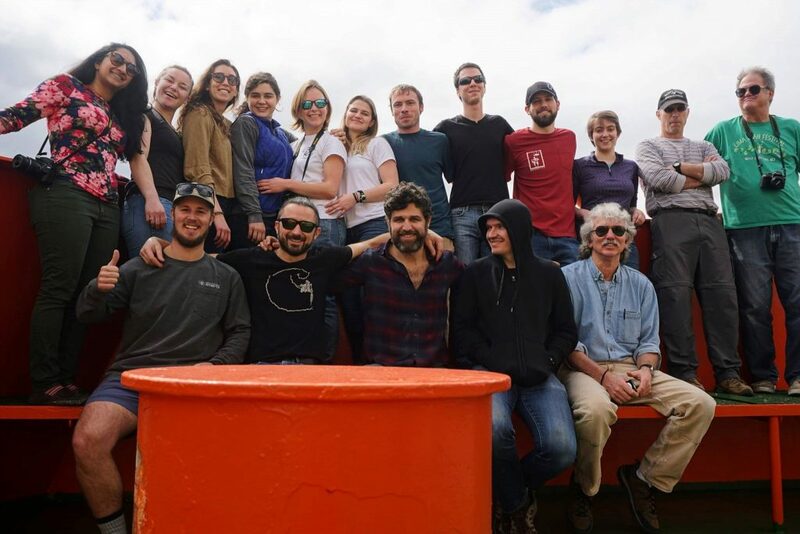 The fourth group aboard the Palmer was Dr. Grace Saba’s team from Rutgers University, who deployed and monitored an autonomous glider fitted with an acoustic sensor that will be used to better understand the composition and food web interactions in the Ross Sea. Being on a research vessel for the first time was an experience that I’ll always value, and it was filled with highs and lows. One of the best parts of the cruise was meeting my fellow scientists and getting to bond with them as time went on. It can be hard to see the same people every day, all day for an extended period of time, but the group got along incredibly well—probably too well if you knew of the shenanigans that took place during the science breaks. Another obvious highlight of mine would be seeing the wildlife and the scenery—pictures honestly don’t do it justice. I’d also being lying if I said one of my happiest moments wasn’t getting off the ship in McMurdo. Being able to walk for more than a few hundred feet in one direction felt amazing after being on board for about a month and a half. With high points, there are always low points. The most glaring low point for me was running out of fresh food half-way through the trip. But, we all survived, and I have a new appreciation for a salad. Additionally, being unable to communicate with my loved ones back home was hard at times. The ship has limited internet—enough to send some messages— but not enough to maintain the constant communication we are so used to today. That being said, it was rather refreshing to unplug from social media for a few months, and I can now say I’m able to live without my smartphone. Overall, the high points of the trip greatly outweigh the low. We were able to see Orcas with the southernmost active volcano, Mt. Erebus, in the background. 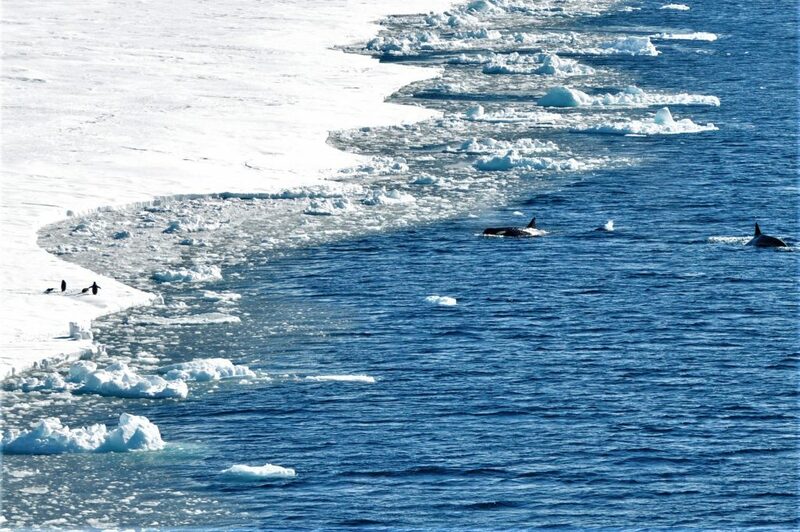 We saw penguins and seals regularly as we transited through the ice. We experienced a sunset after months of constant light in the most beautiful place I’ve ever been. And we conducted some amazing science with an incredible group of people. 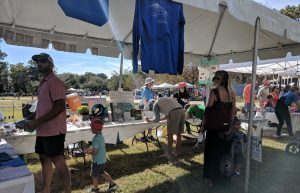 The SCDNR Open House was this past Saturday, October 21. 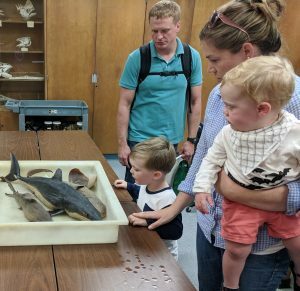 Every two years SCDNR invites the public to meet and talk with marine biologists, fisheries managers, and educators at the Marine Resources Center plus their partners at the College of Charleston, Hollings Marine Lab, NIST and NOAA. 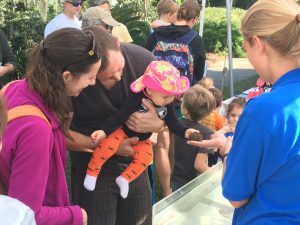 Guests learned about marine science with informational booths as well as tutorials, tours, crafts and fun family-friendly activities. We are happy to be a partner for this event and had a great day meeting the community! 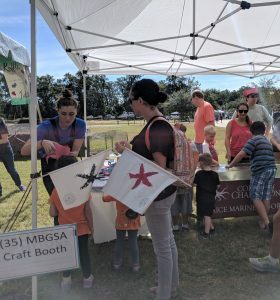 GPMB students hosted a touch tank and offered fun crafts for the kids. GPMB students also had a bake sale and raffle to raise funds for the MBGSA in support of student travel for conferences and events. Guests were invited inside to see some of the resources of the lab and experience hands-on activities. 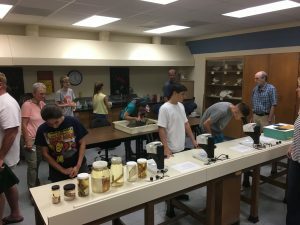 Faculty and students presented preserved sharks and fish, live plankton samples and the entire collections room of over 100,000 preserved fish and invertebrate specimens! Thanks to everyone who made the event a success! It was a great day and we are already looking forward to the next one! 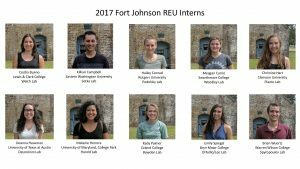 Grice Marine Lab hosted ten students for the 2017 Fort Johnson Summer Research Experience for Undergraduates (REU) Program. They arrived May 31st, hit the ground running, worked for ten weeks, and closed the program with exceptional presentations on August 9th. Each intern was paired with a mentor on the Fort Johnson campus to develop and execute a research project on the program theme of “Marine Organism Health: Resilience and Response to Environmental Change.” Along the way, the interns learned how to share their research in weekly workshops on science communication led by Carolyn Sotka. The program also included lectures, field trips and professional training for careers in science. Cecilia Bueno (Lewis & Clark College). The effects of salinity on sperm function and fertilization in Squirrel Treefrogs (Hyla squirella). Hailey Conrad (Rutgers University). Genetic variation in resistance to ocean acidification during larval development in a northern population of the sea urchin Arbacia punctulata. Meagan Currie (Swarthmore College). A toxicological investigation of the effects of 4-nonylphenol on the coral Acropora cervicornis. Christine Hart (Clemson University). Dynamics of benthic diatom communities: patterns in biomass and composition. Deanna Hausman (U. of Texas at Austin). Toxic effects of oil and UV light on the estuarine shrimp Palaemonetes pugio. Melanie Herrera (U. of Maryland, College Park). Comparison of fish populations in dense and sparse assemblages of the invasive seaweed Gracilaria vermiculophylla. Kady Palmer (Eckerd College). Perfluoroalkyl acids (PFAAs) in plasma of the West Indian Manatee (Trichechus manatus). Emily Spiegel (Bryn Mawr College). Getting in the mood: the effect of environmental stress on the reproduction and productivity of a polar diatom. Brian Wuertz (Warren Wilson College). Investigating the potential of dioctyl sodium sulfosuccinate (DOSS) to promote inflammatory response in macrophage. 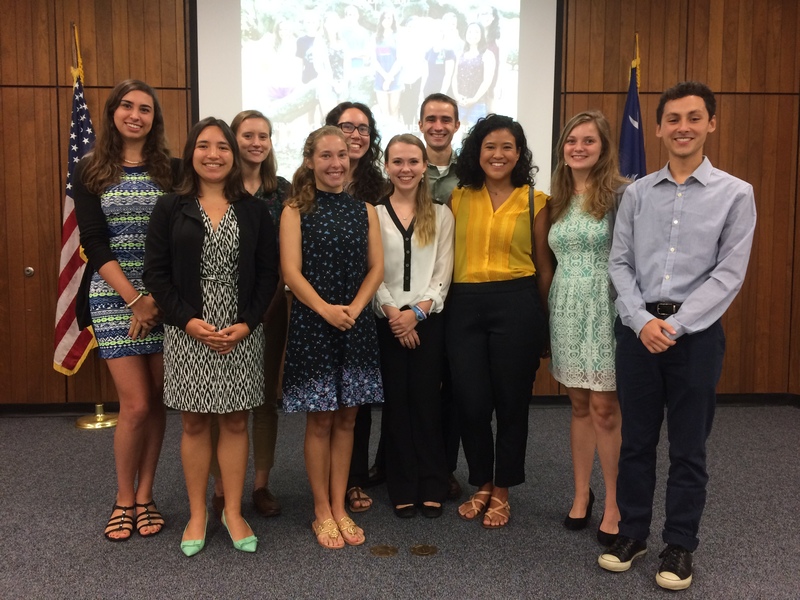 Many thanks to Bob Podolsky, Director, Ft. Johnson Summer REU Program, College of Charleston and Carolyn Sotka, Science Communication Workshop Series, Ft. Johnson REU Program. 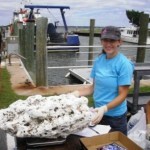 Thanks also go to all the mentors and contributing partner institutions at Ft. Johnson: the Medical University of South Carolina (MUSC), the National Oceanographic and Atmospheric Administration (NOAA), the National Institute of Standards and Technology (NIST), the South Carolina Department of Natural Resources (SCDNR). 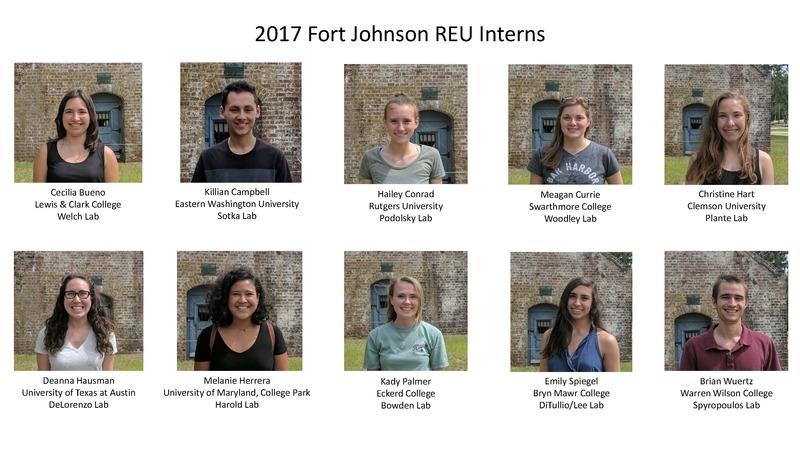 Congrats and great job 2017 Fort Johnson REU Interns! 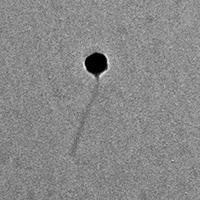 As part of the HHMI Science Educations Alliance Phage Hunters Program, twenty-six College of Charleston undergraduate student were published November 27, 2013 in the recent Genome Announcement. This publication includes two published NCBI Genome Accession Numbers. Hyperlinks to genome accession numbers are within attached paper (Genome Announc.-2013-Hatfull-). Many of these students worked with Dr. Ana Zimmerman here at the Grice Marine Laboratory. Dr. Erin Morris-Richard and Dr. Chris Korey from the downtown campus also worked on this project. The project website lists details of the phages found. With phage names like DirtMcgirt (pictured) and FuzzyWuzzy you should take a look at the wonderful research these students are doing. 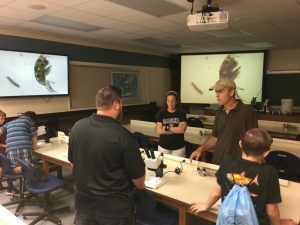 Visiting scientist, Dr. Darwin Jorgensen (from Roanoke College in Virginia), and two of his undergraduate students, Vicki Brings and Micah Spruill, have been looking at the physiological support of underwater walking in lobsters and blue crabs. This lobster, walking at a speed of about 2 km/hr, is instrumented to measure hemolymph (blood) pressure in the circulatory system and hydrostatic pressure in the two gill chambers (located on either side of the thorax). The acrylic mask mounted at the head end of the animal collects the seawater exiting the two gill chambers. The yellow piece in the mask is an electromagnetic flow probe and is used to measure the amount of seawater being pumped through the gill chambers per minute. This work is designed to help us understand how the gills work in concert with the cardiovascular system to support migratory activity in these commercially-important crustaceans. Learn more about the lobster on a treadmill below. Grice Marine Laboratory’s REU students are sparking the Charleston community’s interests in marine science with their ongoing summer research. 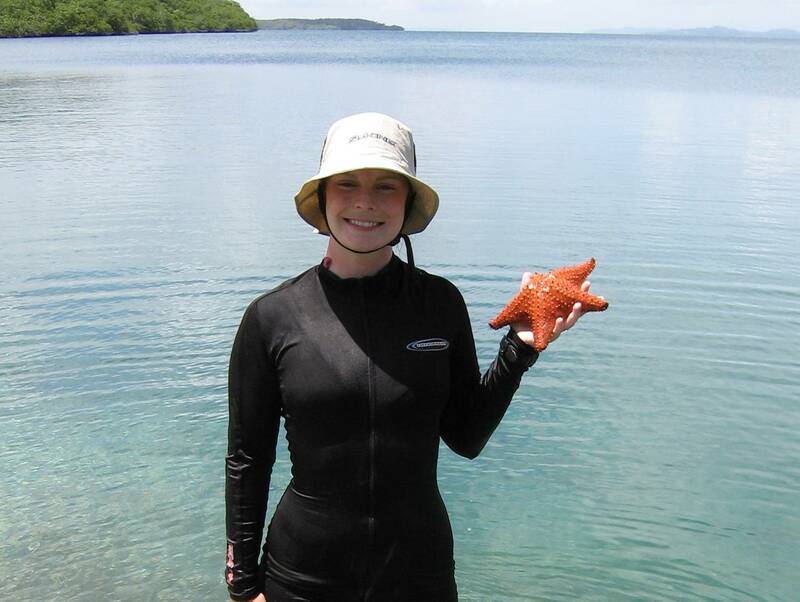 One REU student, Claire Hancock, is acknowledged for her work with coral bleaching. This bleaching technique in coral occurs from various stresses in the marine environment and is fatal to coral. For more information, visit the recent article printed in Charleston’s Post and Courier on July 26, 2009. Former REU Has a Whale of a Story! Jeremy Goldbogen, a Summer 2001 Intern in the Fort Johnson REU Program, has made some stunning discoveries regarding the mechanics of foraging behavior in rorqual whales. Jeremy related the story of his research exploits to the 2009 Fort Johnson REU Interns as part of the new Summer Program lecture series Fort Johnson REUs Reporting Home. Jeremy’s findings form the basis for his soon-to-be defended PhD dissertation at the the University of British Columbia in Vancouver, BC. His work has received extensive coverage in the popular press, such as the New York Times. Listen to the CBC radio podcast. In a newly published article in the journal Biological Bulletin, Hannah Giddens (a former CofC undergraduate) found that elevated seawater temperatures can cause herbivore to alter their feeding preferences, in some cases toward consuming foods that are of poorer quality even when higher quality foods are available. This is the first demonstration of temperature-dependent shifts in feeding preference, and provides another example of how global increases in seawater temperature may alter the dynamics of nearshore ecosytems in surprising ways.